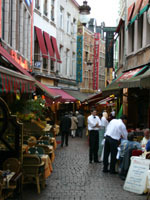 There is a great variety of restaurants in Brussels. If you know what you want to eat and go to the right areas, you will find some delicious choices. The restaurant scene is lively and filled with Belgians and foreigners who work in Brussels every night of the week. Sundays are slightly quieter. Belgians prefer to have a drink after work and start dinner around 8pm so you will find that restaurants are very empty before this time. Many establishments do not require reservations for 2 or 3 guests but if you have a larger group, it pays to book ahead. Good service is easier to find if you enter with a greeting and a smile. There isn’t a big tipping culture because the service charge is already included but if the service is very good then a small tip of €1 or €2 is appreciated. You can either leave this on the bill at the end or in a glass container at the counter. Waiters can normally speak French or English and have English menus on request. In Brussels, there are only a small number of vegetarian restaurants, which are spread out across the city, but many restaurants offer more than one vegetarian option (especially Italian restaurants) and these dishes still taste very good. If you want to find a lot of vegetarian or organic choices in one place, there is a healthy fast-food chain started in Belgium that can be found all over the city. Brussels has a very good selection of French food as there are many immigrants and descendants of Belgians from France and French speaking areas of Belgium, they understand how to serve up very good French cuisine with a Belgian touch. The best Italian restaurants are the ones that sell more than pizza and pasta! There is definitely more to Italian food. A very good area to find modern style Italian cuisine is near Place Chatelain; at the intersection of Rue Americaine and Rue du Page there are some great selections. Wednesday night is drinks evening at Place du Chatelain so all the restaurants will be packed from 8pm onwards. Since these restaurants are good, they will not hurry their guests so you’ll have to move onto the next one! Certainly the area with the most Chinese, Vietnamese and Thai restaurants is near Bourse. The streets on either side of the stock exchange building are filled with Chinese restaurants and noodle shops that tend towards casual dining. The street with the most Thai and Vietnamese restaurants is on Jules Van Praet. Chinese restaurants seem to congregate around the Chinese general food store at 2 Rue de la Veirge Noire. 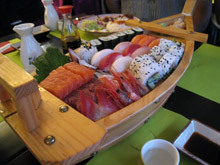 Japanese food is slightly more expensive and spread out over different parts of the city. Try to avoid restaurants around the tourist spots such as the Grand Place and Avenue Louise metro because these are normally designed for tourists. The menu meals are inexpensive but the drinks are overpriced and low quality. The biggest clue is how the tables are set up, with glistening wine glasses, white table clothes and fancy origami serviettes.